Whales have always graced the coastal waters of the Cape. They are found in great numbers all around the coast from Saldanha in the west to Mosselbay in the east and even further up along the coastline. Today they are a tourist attraction and are protected by international as well as local laws. This was not the case in times past. With the arrival and subsequent wrecking of the ship Nieuw Haarlem back in 1647 the presence of whales in Cape waters was noted. With the arrival of Jan van Riebeeck in 1652 whale hunting became a reality. The first whale hunters were sent by Van Riebeeck to Saldanha Bay in 1653 to try their hands at catching a whale or two. They were not very succesful as the water in the bay was too shallow and allowed the whale to keep its strength after being harpooned. When this happened boats were dragged out to sea by the whales and it became rather dangerous for the whalers. Because of the above the Dutch gave up whaling. In the late 1700s after the American war of Independence whaling once again picked up in SA waters. There were more than 40 ships collecting full loads of oil off the Cape. In the 1800s it was reported that whales were being hunted and caught off Dassen Island. When caught they were taken into Table Bay where they processed. Saldanha Bay became the first established whaling station on the West coast of SA . 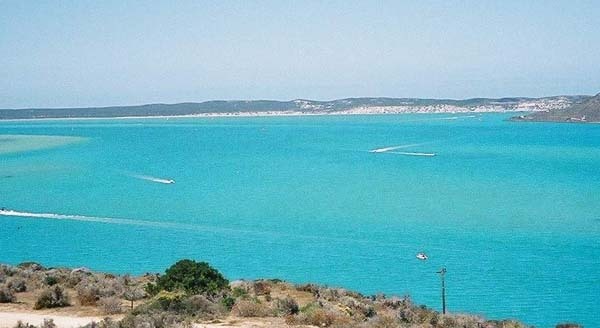 It was established at Donkergat inside the Langebaan lagoon. If you visit this area today you can still see the evidence of the old whalers which are lying rotting in the shallow waters next to the piers. During the First World War whale oil was scarce and needed for the manufacture of explosives. This had the effect of spurring on the whale hunters. It also meant competition and other whaling factories were established on the coast of SA. With the ending of the war and the depression of 1930 whale oil prices fell and so the factories closed down. Unfortunately a second world war came along and the factories were re opened and continued to operate until 1967 when whaling was stopped worldwide. If one visits some of the coastal towns along the West Coast you can still see evidence of the old whaling stations. Yzerfontein is one of them. Most of the harbour area was once used for whaling and if you walk round to the west you can still see foundations of some of the buildings that were once used. Today SA is once again making money out of whaling. Fortunately not from hunting them but from tourism a as people from all over the world flock to see the many whales that visit our coastline. Hermanus on the east coast now has a whale festival in Spring when the whales return to our waters. They have an official whale cryer who walks along the coastline and advises tourists where the best viewing points are. Other places like False Bay and all along the Muizenberg to Simonstown coastline the whales come in very close and you can just about touch them at some places. During the past month there were two Southern Right whales in Table Bay and they were captured on camera by the Indian broadcasters while broadcasting on the cricket world cup. I don't know why the whales were still here as most of the other whales had already left our shores. I suppose they might have had an interest in the World Cup . LOL I'm not sure who they supported as there was no team from Antartica. Oh well they were here and provided a spectacle for all those who visited the east coast of Table Bay.